I think the Epic Day designer papers are my favourite of this year's Stampin' Up offerings and I have very little left. There are lots of colours in the pack but I picked out just corals for this card - and just look at the different patterns! The 1" square punch is so handy for cutting these out. Once I'd laid my inchie grid out, I embellished it with this large sprig of orchid-style flowers from the Peaceful Petals stamp set. I stamped it in Wild Wasabi ink, coloured it with my Stampin' Chalk marker and added speckles with Pool Party and Calypso Coral markers. It was cut out with my paper snips which make short work of an intricate job like this! The birthday sentiment from Itty Bitty Banners was stamped, cut out and stapled to the panel before the card was assembled. It was my bloggin pal Irene from All Occassion Cards Papers and More who got me going with inchies and once I'd started I was hooked! There is something very satisfying about punching out snippets of designer paper and card stock and putting them together so go on! why not give it a try?! I'm long overdue a visit at the Snippet Playground so I'll be linking this card up there. Hope you had a good weekend. After another busy one here I'm wistfully thinking about holidays... the kind where you do lots of lazing about in the sunshine or wandering about very slowly looking at things! There's no rest for the wicked though and I must have inadvertently misbehaved very badly because there's plenty of housework to do here today! Love this "inchie" card especially the colour. Using inches is one of my favourite designs which I don't use enough. I'm hooked on inchies too Vicky, thanks to Irene of course! 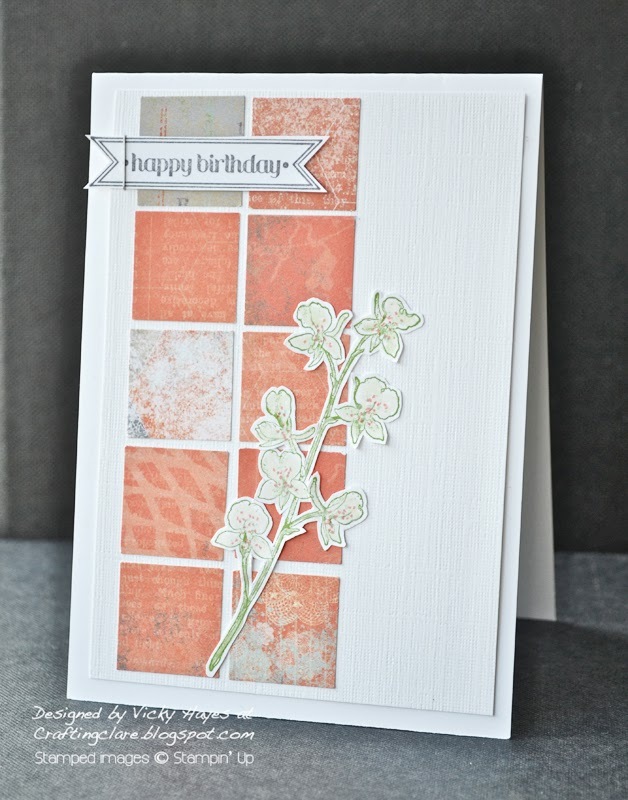 This is a lovely card, super peachy colours and I love the idea of the flower placed on top. Great to see you in the Playground again! Great inchie card and I love the colour palette. What a fab card Vicky, love the inchies and I think I need a square punch to use up all my scraps! A fabulous card, LOVE the inchies and your cutting out is awesome, I thought it was a die. A holiday sounds wonderful, we haven't been able to have one for 8 years, due to my son's illness, he's a little better now so MAYBE, this year? I'm so impressed with cutting of the flower. I love the coral colour theme too. Hugs Mrs a.